Amazing Spider-man #1 CGC 5.0, 1st Spidey in own title! 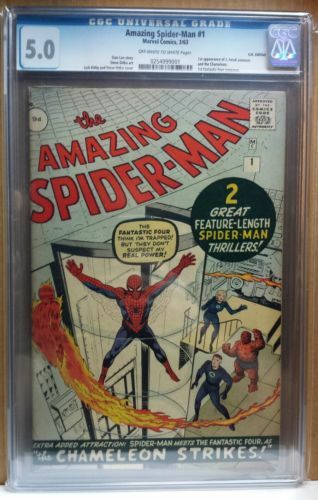 The Amazing Spider-man #1 CGC 5.0! Off White to White Pages from March 1963! 1st Spider-man in he's own title! 1st app of J John Jameson & the Chameleon! Steve Ditko & Jack Kirkby cover! I will ship in a 'bomb proof' box. No question! If you have any queries please don't hesitate to get in touch and hopefully we can strike a deal. Book has been stored out of direct sunlight in a comic box in a smoke free home. If your local your more than welcome to pick this up in person.Allso I travel between Preston & Plymouth quite regular so if your in & around the M6,M5 and A38 (North West down to South West England) I could meet or even drop off. I now travel up to Scotland regular aswell. I am open to Trade's (equivalent value) or part exchange.Will also consider time payments however email me first or call me on: 07525426981 I take paypal, cheuqe (item will ship once cleared) or better still cash on collection. Rest assured this will be packed with the protection it deserves! Bid with confidence 100% feedback. Any questions feel free to ask.Feedback left once received. Item will ship on reciept payment.Payment expected no more than 2 days of auction end.Pick up more than welcome.